Not in the mood to whip up a complete Thanksgiving feast this season? No worries…AML has located the five best local restaurants offering delicious and wholeheartedly decadent Thanksgiving dinners for you to choose from around the western burbs! Whether you are dining in or dining out this holiday, have a most blessed and wonderful Thanksgiving with family and friends. The Farmhouse at People’s Light & Theatre hosts their annual Thanksgiving dinner this year with seatings from 12pm to 8pm. 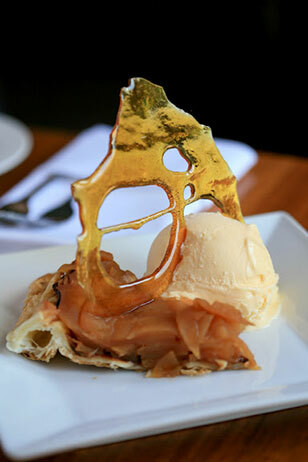 Pictured is their famous Farmhouse Apple Tart Tartin. Experience the charm of Malvern’s The Farmhouse Bistro and their restored 18th century farmhouse this Thanksgiving! Guests can also choose to dine with the entire family in the beautifully appointed ballroom. Seatings are available from 12pm to 8pm. Reserve your table now online through OpenTable or call 610.647.8060. Start a new tradition with family and friends and dine at Ruth’s Chris Steak House this year! Ruth’s Chris is offering a special Thanksgiving dinner with all the dressings for only $34.95. Be sure to call to make your reservations: 610.992.1818. Bring the entire family to The Gables at Chadds Ford this Thanksgiving and enjoy a fantastic buffet. The restaurant will be open from 1pm to 6pm. Adults are $29, Children 12 and under are $14. Children 4 and under eat for free. Goodies awaiting you include: butternut squash bisque with spiced crème fraiche; roast turkey with giblet gravy; sweet potato gratin; sausage and dried cranberry stuffing; roast beef and ham carving station; apple cranberry crisp and more! View the entire Thanksgiving buffet menu. The Valley Forge Casino Resort’s first Thanksgiving season features an outstanding dinner at Pacific Prime for $44 per person. The restaurant will be open from 5pm to 10pm. The special menu includes the choice of soup or salad, one entrée and two accompaniments per person. View the entire Thanksgiving menu. Sullivan’s Steakhouse in King of Prussia is taking the fuss out of your Thanksgiving feast this season with their sides-to-go! 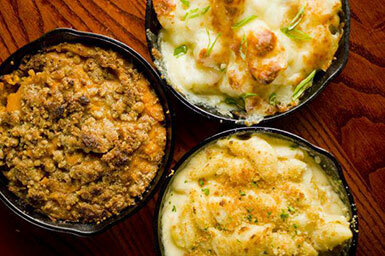 Sullivan’s Steakhouse in King of Prussia is looking to take the fuss out of your Thanksgiving feast this year by offering their delectable sides-to-go. Place an order to pick up, on Thanksgiving Eve Wednesday, November 21st. Choose from the six sides available or order all of them! Side selections to go are: creamed corn, creamed spinach (my personal fav) brussel sprouts, sweet potato casserole, mac n’ cheese and horseradish mashed potatoes. Prices for the sides range from $8 to $27. Call Sullivan’s to place your pick-up order: 610.878.9167.